How else would you keep a drink warm? It's the season for giving and receiving, for eating and imbibing. And sometimes it's best when all those elements of the season are combined. Even though a tin caramel corn or box of chocolates can be a much-appreciated gift this time of year, I'd like to offer a few alternative suggestions -- including local versions of some classics -- for you to stuff the stockings of loved ones with this year. And if you don't have any stockings? I like to think these are all items that can be enjoyed, no matter the occasion. Dutch Desserts, based in Kinderhook, is best known for their fruit tarts. 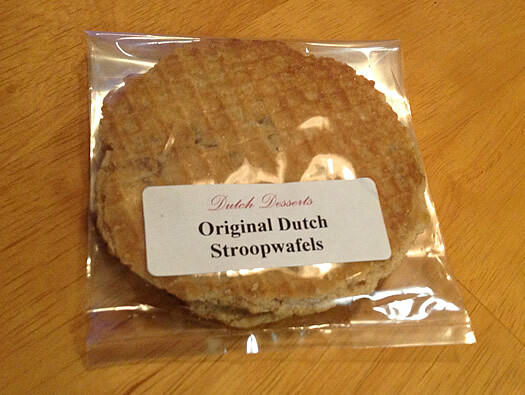 But with a name like theirs, it's no surprise that they also make stroopwafels -- a sort of waffle cookie stuffed with caramel syrup. Originating from city of Gouda in the 18th century, the stroopwafel is fun and tasty and feels like a dessert made for the Christmas season. 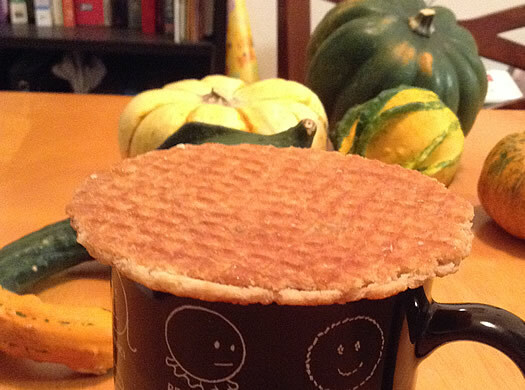 In fact, one way to eat a stroopwafel is to place it atop a mug of your favorite hot beverage, allowing the waffle exterior to soften and the syrupy interior to melt a bit. The waffle part of Dutch Desserts' stroopwafels is only mildly firm and pairs delightfully with the sweet interior. The ingredients are simple: unbleached white flour, rice syrup, brown sugar, salted butter, milk, yeast, egg, and extract. Despite that, you may find yourself hooked. If so, feel free to join the Association of Stroopwafel Addicts. I found a package of two Original Dutch Stroofwafels for $2.99 at Honest Weight Food Co-op in Albany, but Dutch Desserts sells at a number of locations throughout the region. Sparkling, non-alcoholic cider is a popular drink around the dinner table during the holidays. But especially in light of the state government's support for the cider business, I propose enjoying some less fizzy, "hard" cider this season. 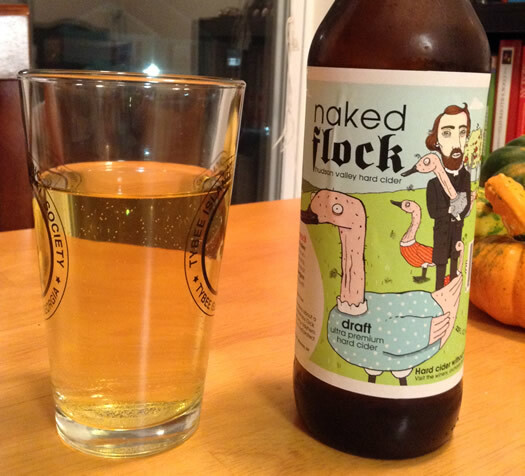 Naked Flock, a cider made at the Applewood Winery in the Hudson Valley town of Warwick, features an eye-catching label based on an amusing area folk tale that includes a small-town pastor, author Herman Melville, poppy seeds, and plucked geese. Beyond that, however, is a very tasty cider. I enjoyed the "draft" version, a 22 oz. bottle acquired at Honest Weight for $8.99, which includes Belgian Trappist ale yeast and organic maple syrup on top of the juice from locally-grown apples. Naked Flock went to market less than two years ago, though the makers have been crafting their products for two decades. That experience shows in the draft cider, which is more complex than your typical store-bought cider thanks to the additions of yeast and maple syrup. Pale yellow and mildly bubbly, apple is the most prominent flavor. There's both sweetness and a bit of acidity, with a mouthfeel slightly thicker than that of an average cider. Candied nuts are, of course, a popular gifting option for Christmas. But not all nuts are created alike, and some of those found in supermarkets contain many additives you might not expect. Our Daily Eats, a nut and granola-maker out of Delmar, keeps it simple. Their Sweet Maple & Salt Pecans have a wonderfully minimalist list of ingredients: pecans, maple syrup, and sea salt. You can get a 3.5 oz. bag of these for $4.29 at Price Chopper (along with many other retailers). While this isn't inexpensive -- the cost of pecans has gone up recently -- you can appreciate the quality of the product you're purchasing. And you can enjoy the taste of it, too. Pecans on their own are a lovely nut -- how many others are made into pies, after all. They're also one of the fattiest of nuts, which provides a pleasant richness that is cut here by the maple and sea salt. 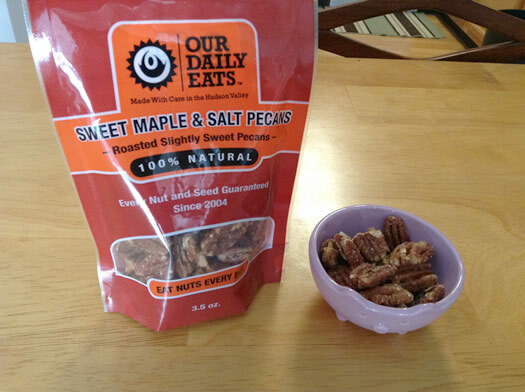 Our Daily Eats applies the maple in moderation, making sure these nuts aren't too sweet, while the salt really pops, enhancing the natural flavors of the pecans. A package of it from Trader Joe's contains two heads of garlic. The outside skin is tan and a bit wrinkled. Inside, each clove is black and soft enough to spread. It acquires its color and texture through fermentation. 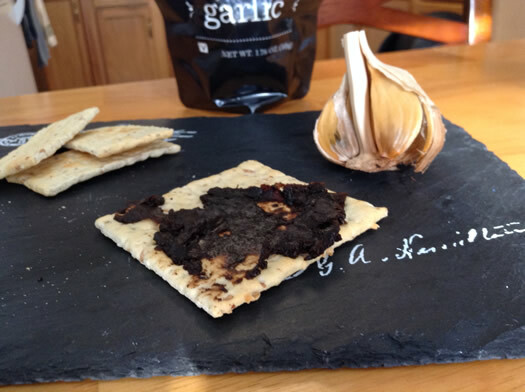 I've enjoyed the black garlic spread on bread and crackers, though it's also suggested for use in sauces or dressings. The taste, described on the outside of the bag as "sweet and mild," is remarkably unique. It may be mild compared to regular raw garlic, but that doesn't mean it's lacking in flavor. I first noticed hints of soy sauce -- it is said to have similar umami qualities -- and maybe some backing tang of black vinegar to go along with a bit of sweetness.